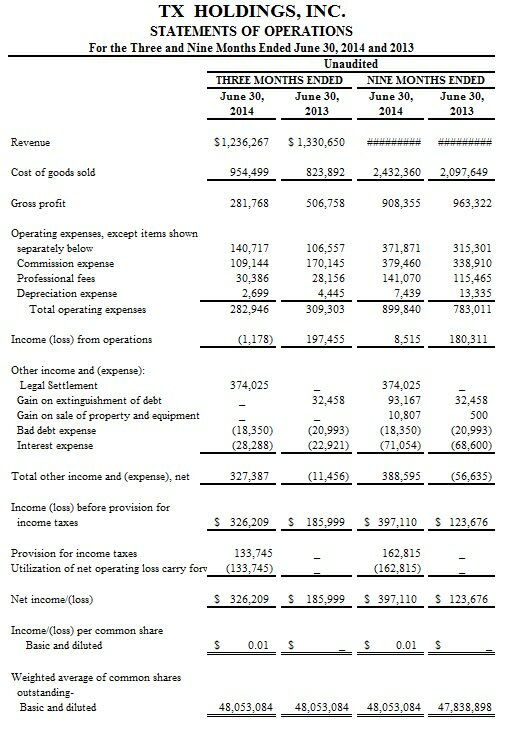 ASHLAND, KY , United States / ACCESSWIRE / Aug 5, 2014 / TX Holdings, Inc., (OTC QB:TXHG) a supplier of mining and rail products to the U.S. coal mining industry, today announced financial results for its 2014 third fiscal quarter. 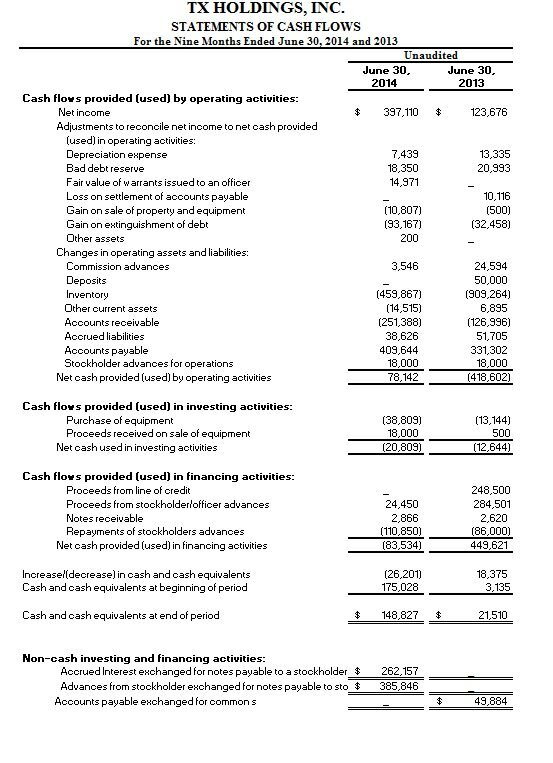 During the 2014 third fiscal quarter, the company reported quarterly revenue of $1,236,267 versus $1,330,650 for the quarter ended June 30, 2013. Income from operations during the third quarter of fiscal 2014 was ($1,178) versus income from operations of $197,455 during the comparable quarter of 2013. Net income rose to $326,209 during the quarter ended June 30, 2014 from $185,999 for the comparable quarter of 2013, representing a 75.5% increase. Revenue for the three months ended June 30, 2014 was $1,236,267 as compared to $1,330,650 for the same period in 2013, a decrease of $94,383 or 7.1%. Cost of goods sold was $954,499 as compared to cost of goods sold of $823,892 for the same period in 2013, an increase of $130,607 or 15.9%. Gross profit for the quarter ended June 30, 2014 decreased as a percentage of revenue to 22.8% from 38.1% for the same period in the prior year. Operating expenses for the three months ended June 30, 2014 were $282,946 as compared to $309,303 for the three months ended June 30, 2013, a decrease of $26,357 or 8.5%. Commission expense was $109,144 compared to $170,145 for the same period in 2013, a decrease of $61,001 or 35.8%. Other operating expenses increased by $34,160 or 32.1% compared to the same period in 2013. Loss from operations for the quarter ended June 30, 2014, was $1,178 compared to income from operations of $197,455 during the same period in 2013, a decrease of $198,633 or 100.6%. At June 30, 2014, cash and cash equivalents were $148,827 as compared to $175,028 at September 30, 2013. Cash provided by operating activities during the nine months ended June 30, 2014 was $78,142 compared to cash used in operations of $418,602 during the same period in 2013. Cash used in investing activities for the nine months ended June 30, 2014 was $20,809 compared to cash used in investing activities of $12,644 for the nine months ended June 30, 2013. During the nine months ended June 30, 2014, cash used in financing activities was $83,534 compared to cash provided by financing activities of $449,621 during the same period in 2013. 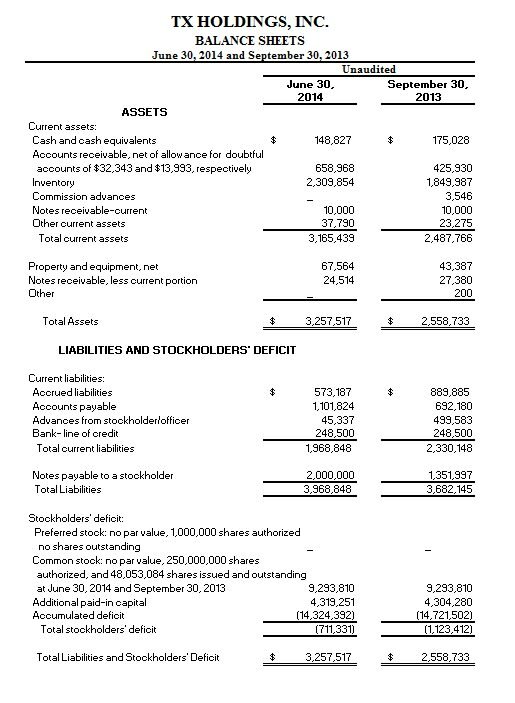 Accounts receivable were $658,968 as of June 30, 2014 as compared to $425,930 as of the year ended September 30, 2013, an increase of 54.7%. Inventory was $2,309,854 as of June 30, 2014, an increase of 24.9% as compared to the year ended September 30, 2013. The increase was the result of management’s decision to increase inventory levels and purchase of new inventory products to meet anticipated higher sales demand. “I look forward to speaking with our shareholders and going into greater detail regarding highlights of the quarter and our go-forward plan today at 10:30am EDT in the Company’s Third Quarter Teleconference,” stated William “Buck” Shrewsbury, CEO & Chairman of the Board.